Hot water not lasting as long? Water in your water heater pan? Not to worry, the water heater repairman at Reliable Plumbing & Heating Services can repair your water heater quickly and efficiently. Contact us today and we will have one of our repairmen arrive to repair your water heater. Age and lack of routine maintenance are the most common reasons for water heater failure. As with most products, the age of a water heater is a contributor to issues arising. By maintaining and preforming regular maintenance the life of your water heater can be extended. A water heater can last up to 15 years if properly maintained by a professional. Reliable Plumbing & Heating Services has over 35 years of experience handling Monterey County's water heater repairs and maintenance. Contact us today to have your water heater issues resolved. Your water heater is an essential component of your home. Water heaters give us comfort. They also provide us with the hot water needed for proper sanitation throughout our homes and businesses. Hot water kills bacteria and cuts through the oils and films where bacteria thrive. Never worry about being without hot water again! 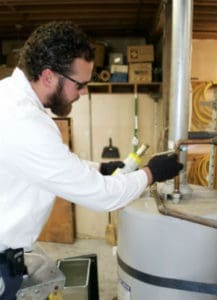 Trusting us with your water heater repair or replacement means you have a two-year satisfaction guarantee on parts and labor. After careful analysis of your situation, based on cost we will recommend replacing or repair your water heater. When repairing our technicians use only top-quality parts. When it comes to water heater repair you can count on and trust Reliable Plumbing & Heating Services. Contact us today for expert repair service.